U2 were joined by Jimmy Fallon for a performance of their 1988 hit, “Desire”, at New York’s Madison Square Garden on July 22. The surprise appearance on the group’s “Innocence + Experience” tour began when Fallon was called on stage from his spot in the crowd on the floor, where he held up a sign that read “singer with a broken finger." "I'm a big fan of Irish people that fall down and hurt themselves," said Fallon when he arrived on stage with an introduction by Bono. "So you're like a mentor to me, brother. Edge, what you did a couple of weeks ago falling off the stage was classic, brother. I'm happy to be a part of the club." The reference calls upon Bono’s bicycle injury in New York’s Central Park last November, as well as guitarist The Edge’s fall off stage during the tour’s opening night in Vancouver on May 14. Still wearing a cast, Fallon recently suffered a serious injury to his left hand that almost cost him a finger when he fell in his apartment at the end of June. Fallon shared the behind the scenes story of his U2 performance the following night on his NBC show. 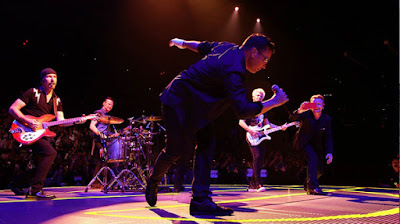 The July 22 appearance was one of 8 shows at Madison Square Garden that will see U2 wrap up the North America leg of their tour on July 31 before taking a five-week break; they’ll return to live action in early September to play across Europe.